You’re on the B/Q subway heading towards Sheepshead Bay, Brooklyn, you detrain at Sheepshead Bay Station, make a right onto Sheepshead Bay Road and enter the establishment at #1655. You likely thought you were in Sheepshead Bay. Given the signposts, a reasonable assumption. But it appears that you have been transported some 4,444 miles to Belarus – and the feast that you’re about to enjoy will only confirm that notion. Evoking the impression of a Belarusian cottage (хата), the décor is picture-perfect, from the roughhewn tables and rustic fences to the charming artwork, wall hangings and sconces; even the wooden menu covers reflect the theme. 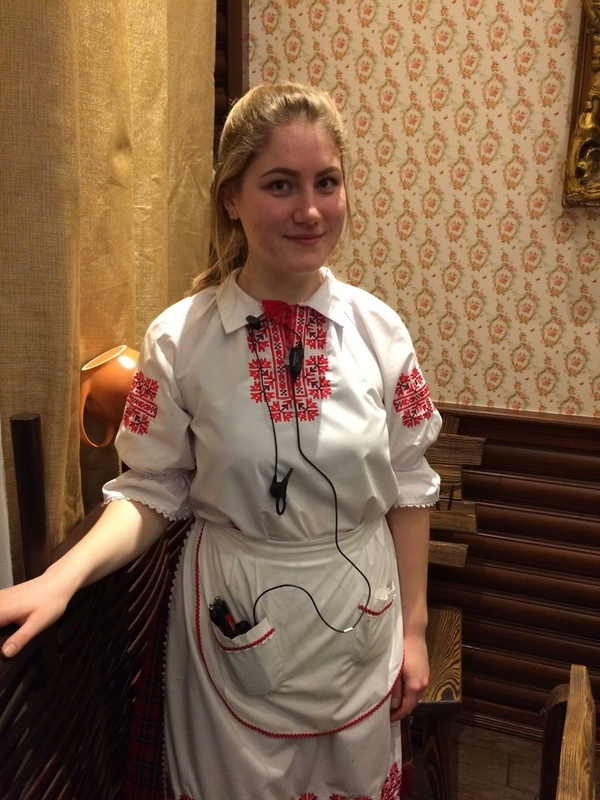 And the incredibly attentive and helpful staff, clad in enchanting authentic garb, will guide you through your experience with such appreciation for their homeland and knowledge of its cuisine that you’ll come away feeling that you have been immersed in Belarusian culture, if only for a brief moment in time. 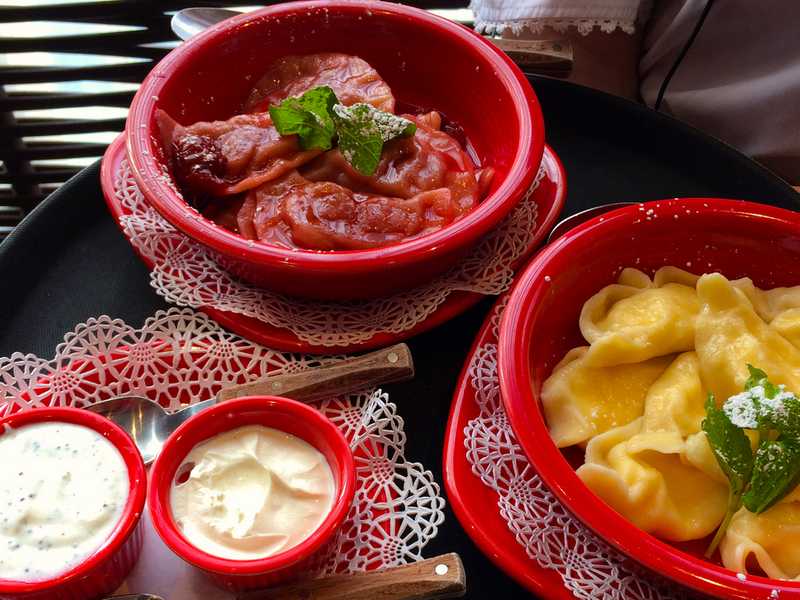 The food shares some features of other Former Soviet Union cuisines: there’s no shortage of potatoes and pork with hearty, creamy sauces; and vegetables, when they make an appearance, have been puckeringly pickled. 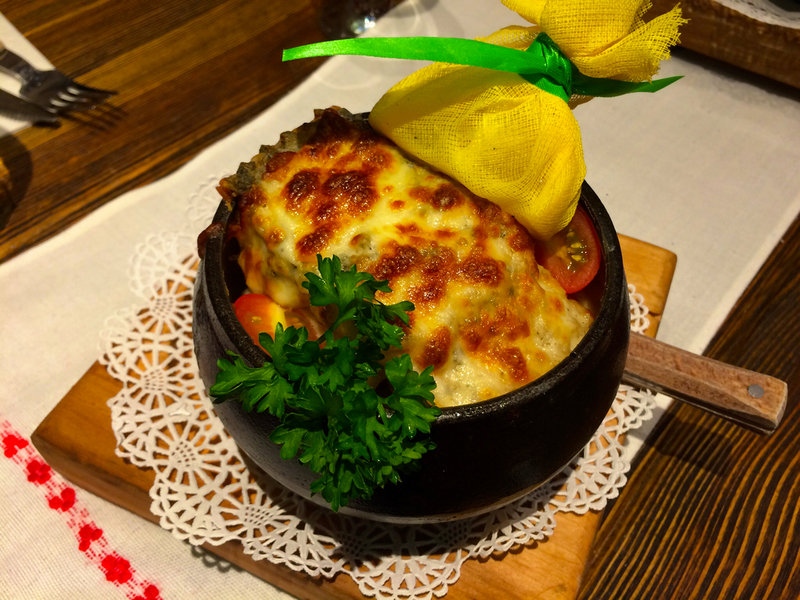 But make no mistake, it is unique to Belarus and everything I tasted was delectable – each of the four times I visited since their opening last fall! 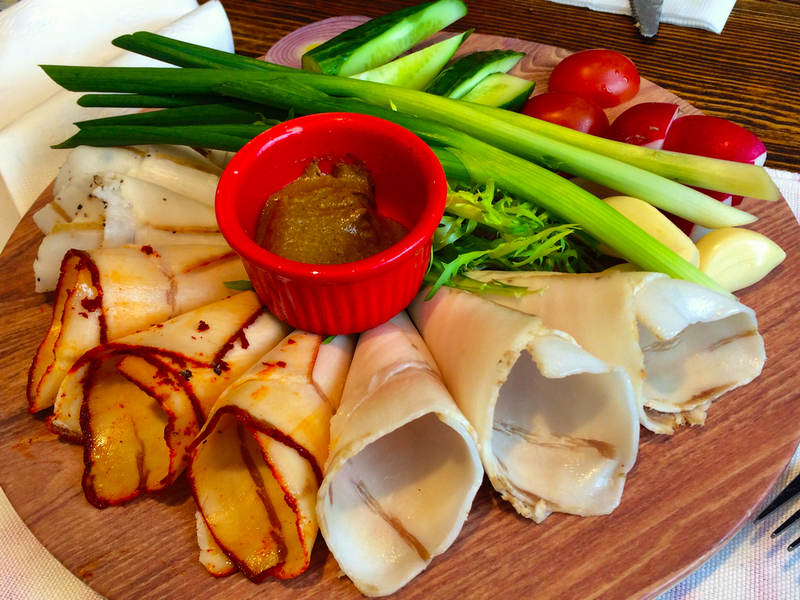 The Appetizer “Village Style” sets out three different kinds of salo (cured fatback, not unlike Italy’s lardo): plain, smoked, and Hungarian style – kissed with paprika – served with chunky fried potatoes and greens. 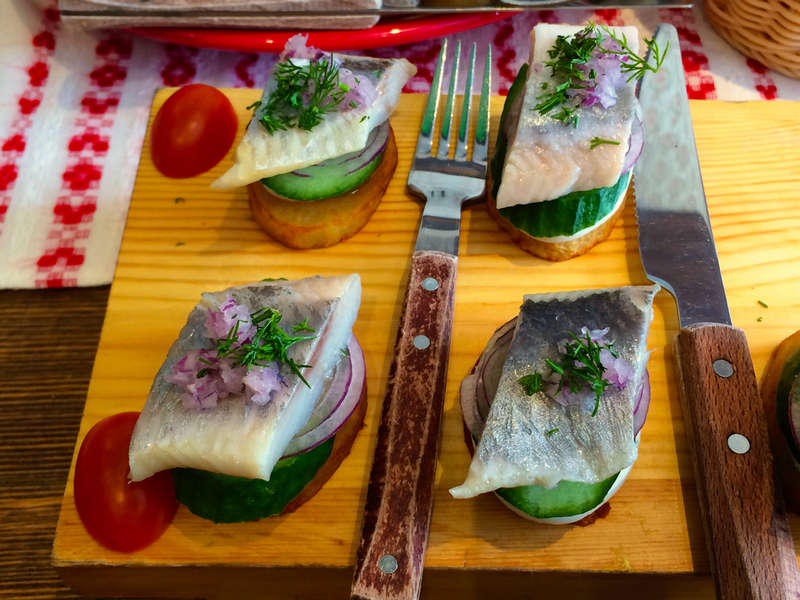 I recommend constructing each forkful with a bite each of salo, potato or bread, one of the greens, and a bit of mustard. Highly enjoyable. Herring “Village Style” consisted of herring fillets layered over potato, egg, cucumber, and onion, a perfect marriage of flavors and a lovely presentation. Meat Assortment “Belorusskaya”. 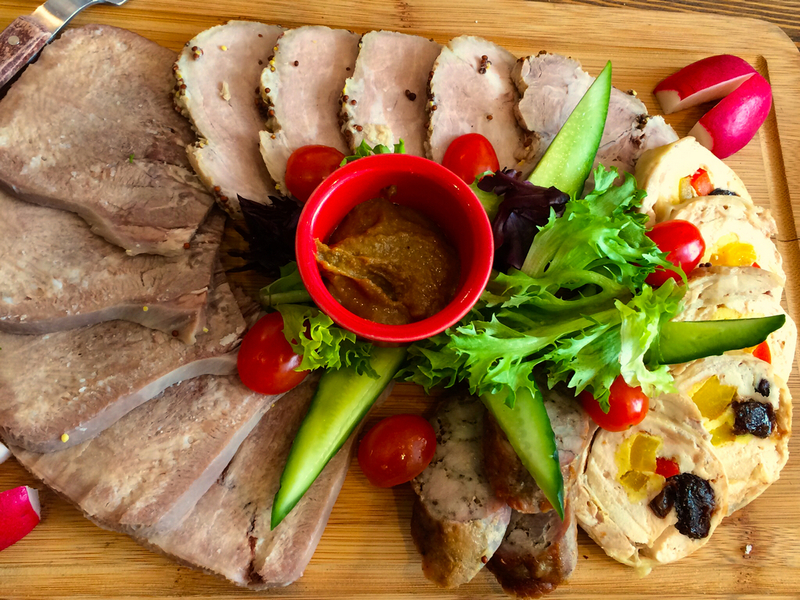 Beef tongue, roast pork, chicken roll, and peasant sausage fanned out across a wooden platter, served with horseradish or mustard. 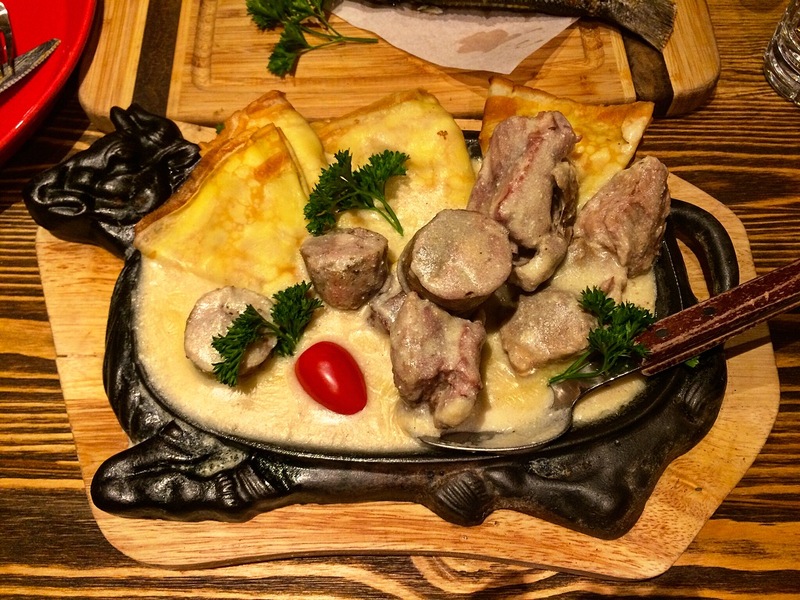 Machanka, a traditional Belarusian specialty featured three kinds of pork – homemade sausage, pork ribs, and roast pork shoulder – in a tempting creamy gravy that reminded me a little of veal blanquette but on steroids. 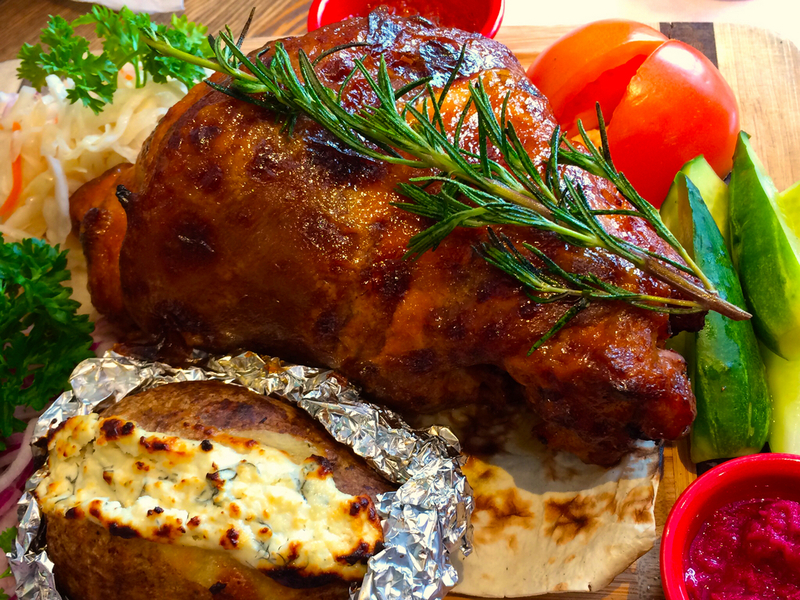 All of the meats were wonderfully flavorful and tender. You have the option of ordering the dish with either blini or potato pancakes but I highly recommend the blini in this case. Absolutely not to be missed. 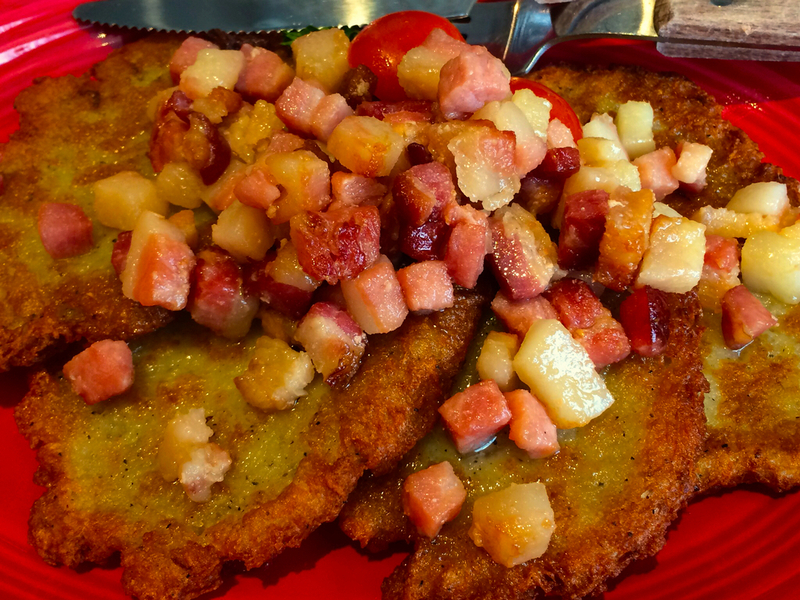 Potato Pancake “Kupechesky Style” (pronounced koo-PETCH-e-skee) is another must have. 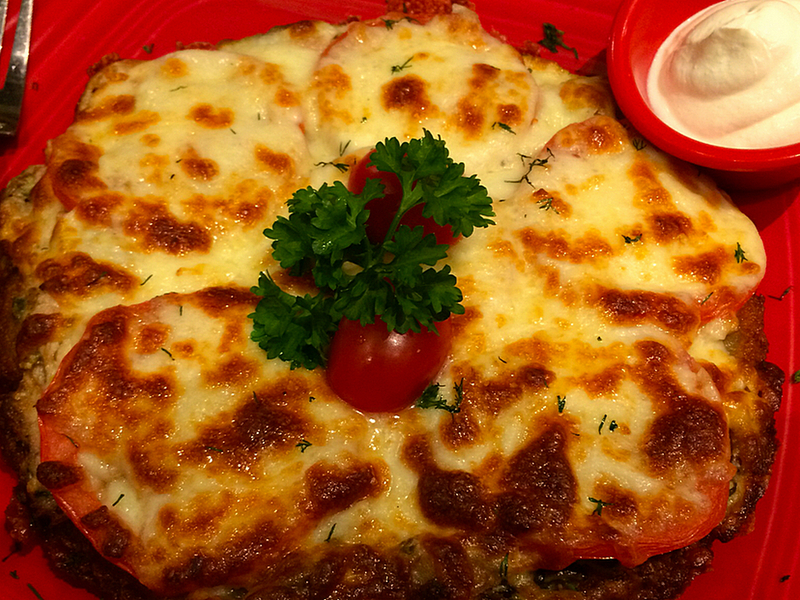 Grated potatoes, pork brisket, tomato, mushrooms, cheese, and mayonnaise combine to make another amazing dish. 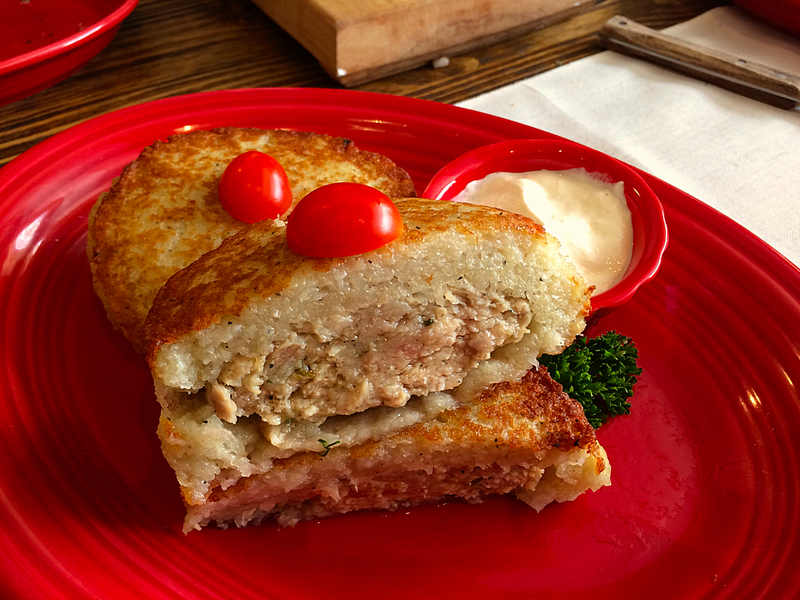 Potato Babka “Bobruisky Style”, named for the city in Belarus. You may be conditioned into thinking of babka as a form of coffee cake, but the word actually means “grandmother”, and by extension, something your grandmother would bake and serve you with a side of love. 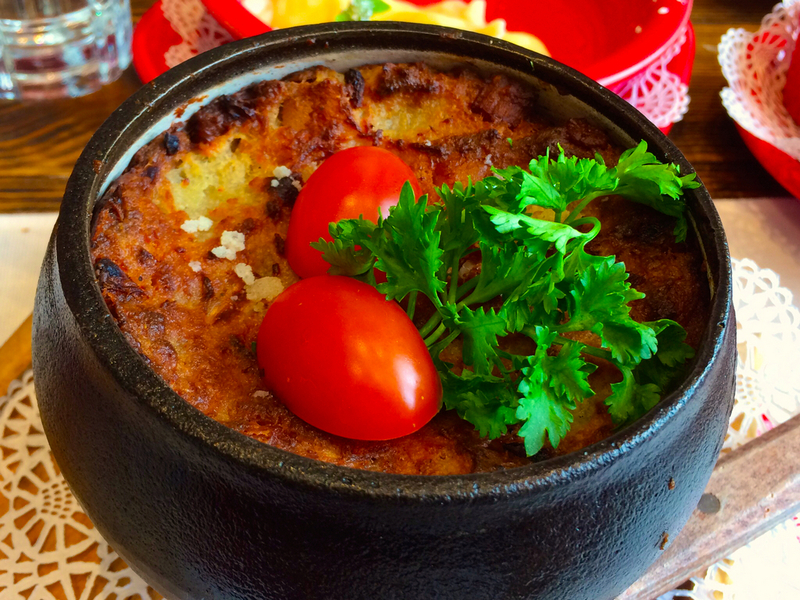 If you’ve ever had potato pudding (or kugel), you’ll immediately recognize this grated potato/egg mixture – Eastern European comfort food in a pot. Potato Kolduni (pronounced kol-doo-NEE) with Mushrooms. Another must order. 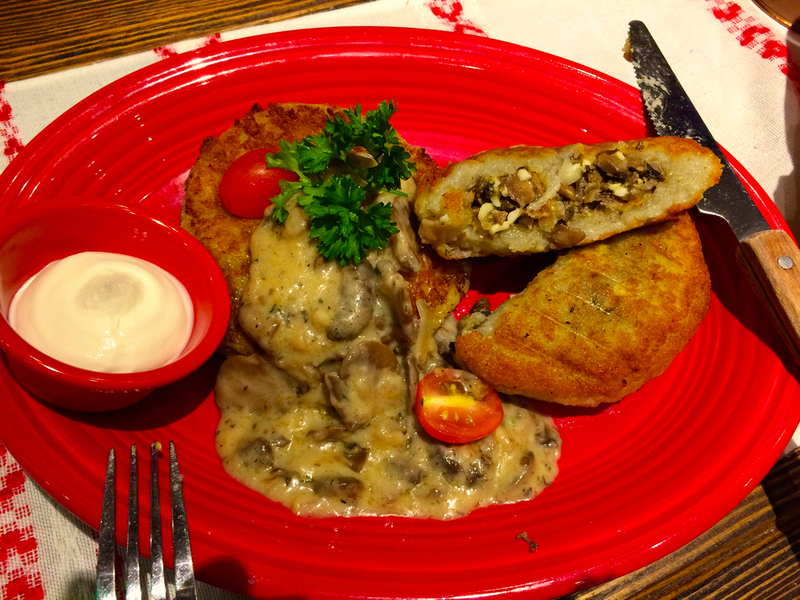 It’s the grated potato/egg concoction but stuffed with mushrooms, boiled egg, and fried onions in a tasty mushroom sauce. Also available with chicken (second photo) or pork and beef, but my favorite was the mushroom version. Pork Knuckle “Village Style”, braised for tenderness then baked for Maillard-crisp flavor was falling off the bone. 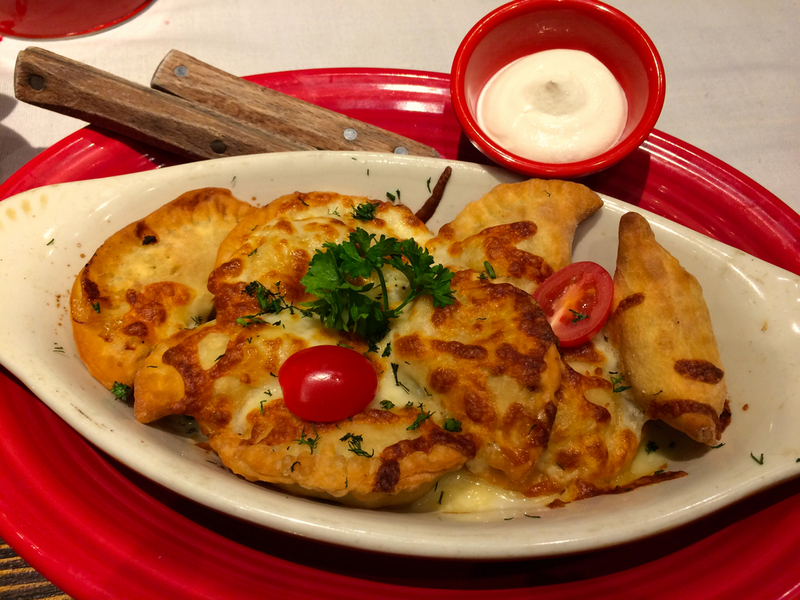 Sour Cherry Dumplings and Cheese Dumplings – sweet and delicious. 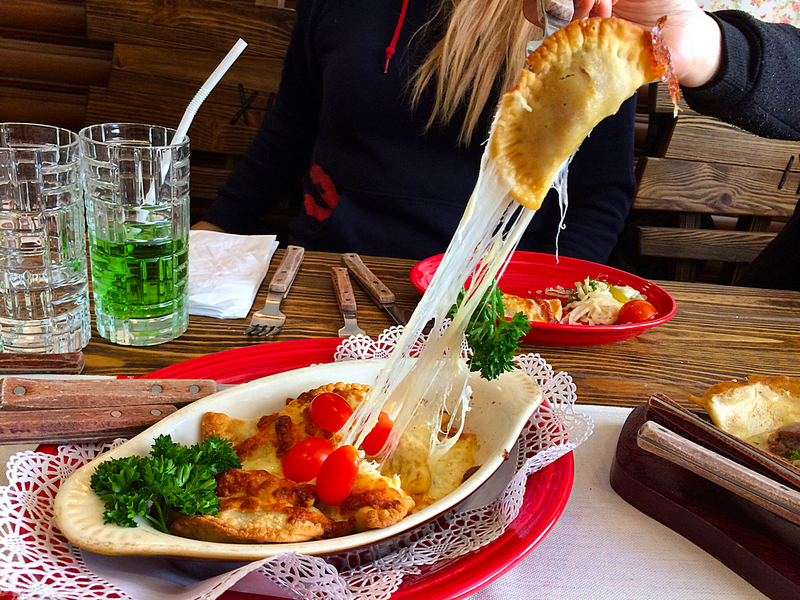 Fried Meat Dumplings “Grodno Style”, also named for a Belarusian city. Fried dumplings filled with chopped beef and pork seasoned with onions and spices provided a solid contrast to the sweeter dumplings. Second photo: Gotta show the cheese pull, right? By the way, that day-glow green drink on the left is tarkhun, tarragon soda; it has that anise/licorice/tarragon flavor profile that some folks love. Baked Tongue in Dutch Oven. 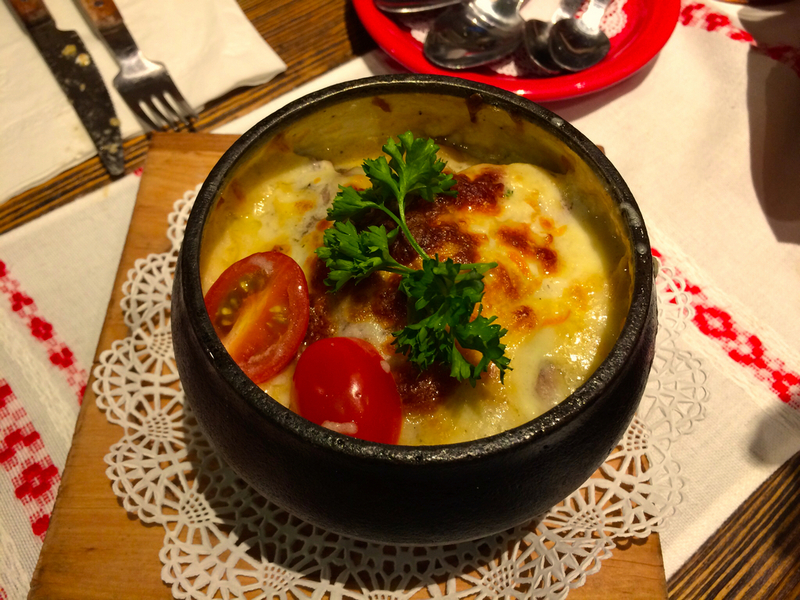 Tender and savory beef tongue with potatoes finished in a Dutch oven with cream sauce and cheese. If you think you don’t like tongue, try this: it might change your mind. 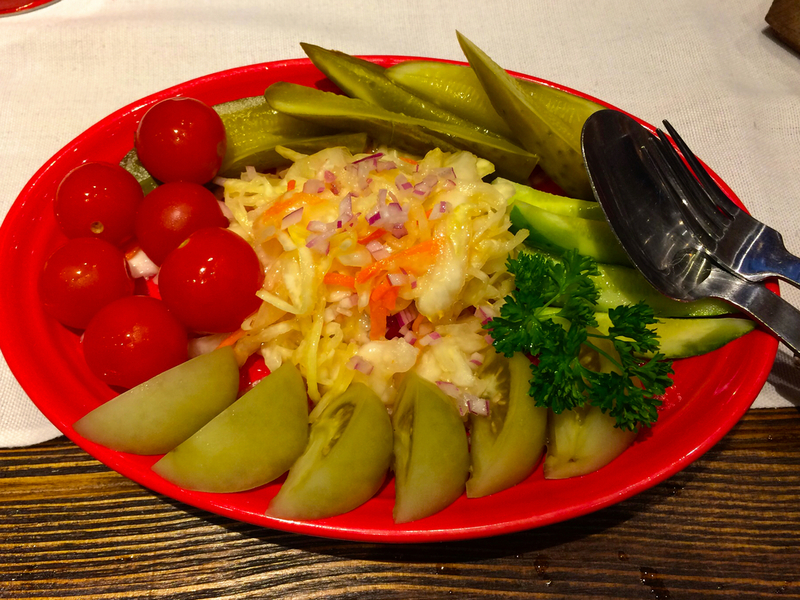 Belarussian Pickled Vegetable Platter. Cabbage sauerkraut, two kinds of pickled cucumbers and two kinds of pickled tomatoes (green and cherry); this dish is a perfect foil for heavier fare. Carp Baked In Dutch Oven. Carp fillet with onions, carrots, mushrooms, and potatoes in a creamy white sauce. Potato Pancakes with Cracklings served with sour cream and copious bits of pork. Chicken Giblets with Buckwheat (Kasha). 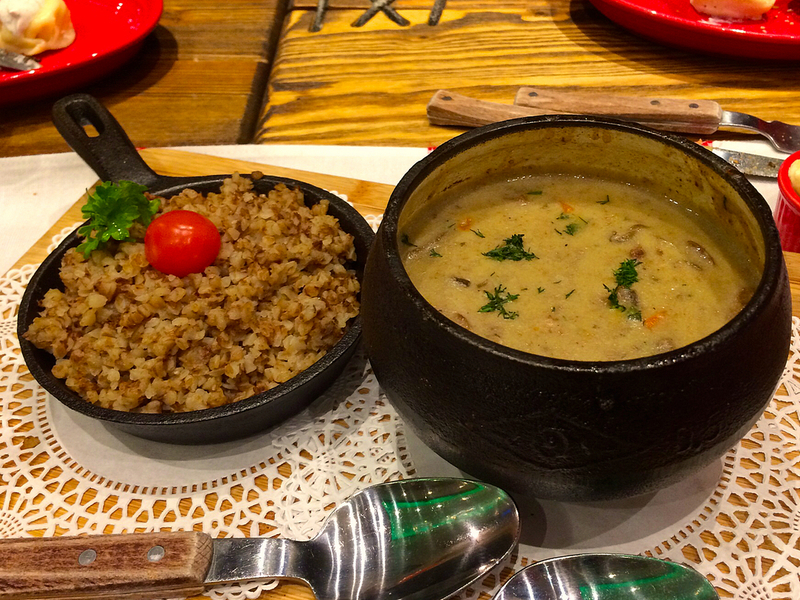 Chicken hearts and liver in a creamy sauce of onion, carrots, and mushrooms with a side of buckwheat groats. Also available with mashed potatoes, but order the kasha! 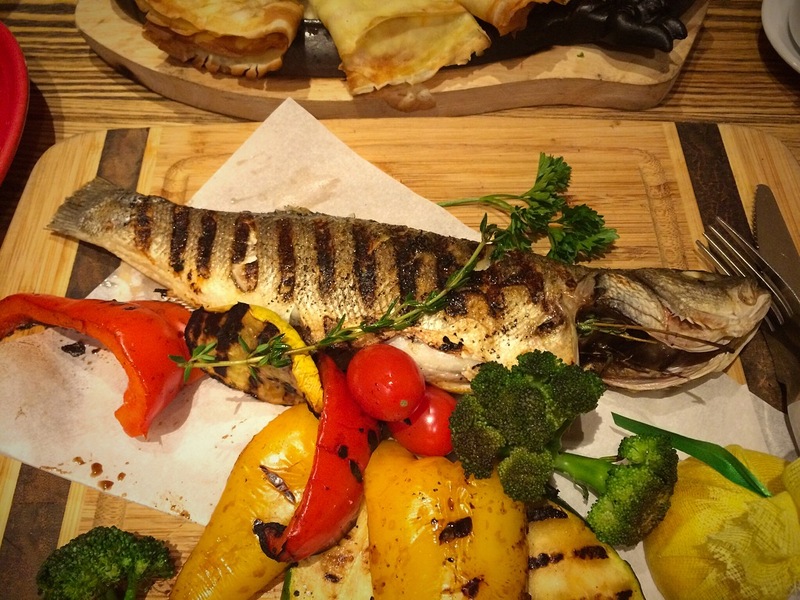 We also got the Grilled Branzino with Vegetables, technically not a Belarusian dish, but one of us was craving fish and the grilled vegetables were a welcome addition. The kitchen did a good job here as well. 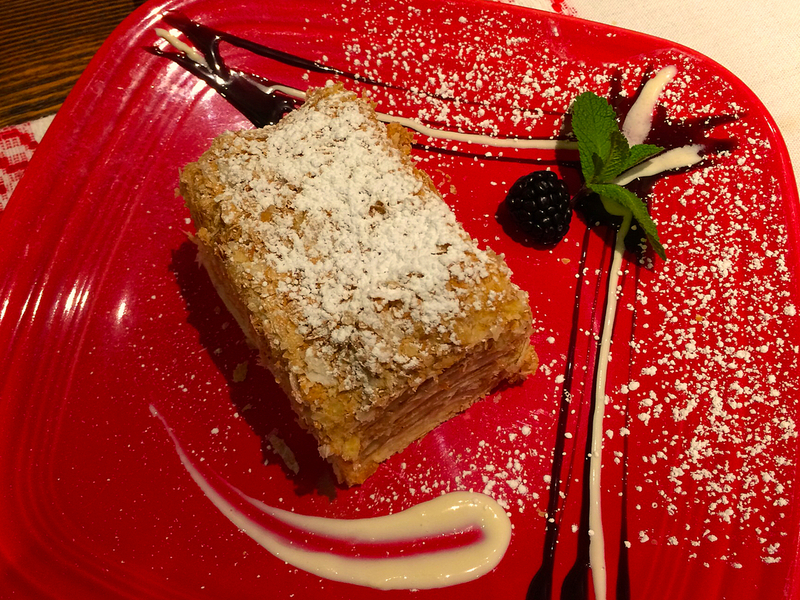 Napoleon – one of three luscious desserts we tried. Masculine Ideal. 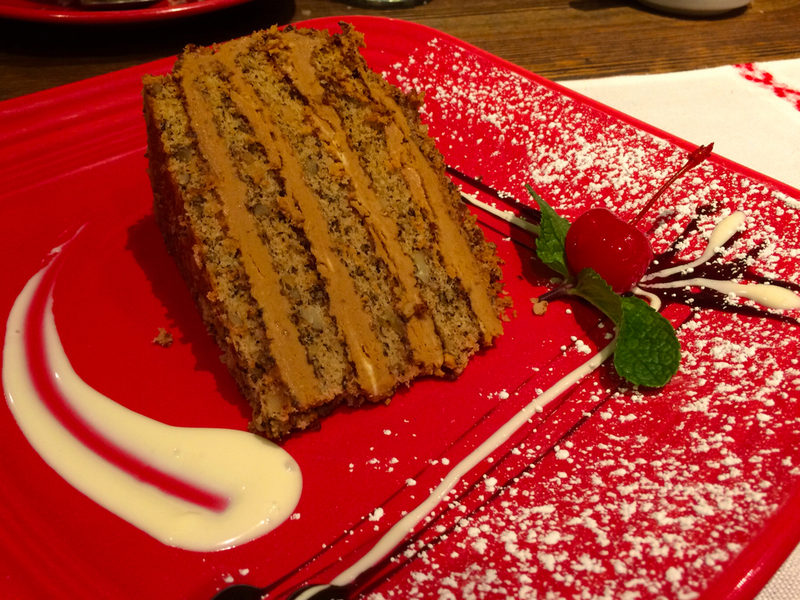 I’m generally not a cake eater, but the abundance of caramel dulce de leche and nuts had me hooked on this distinctive dessert. You’re probably wondering about the name, but it’s traditional. 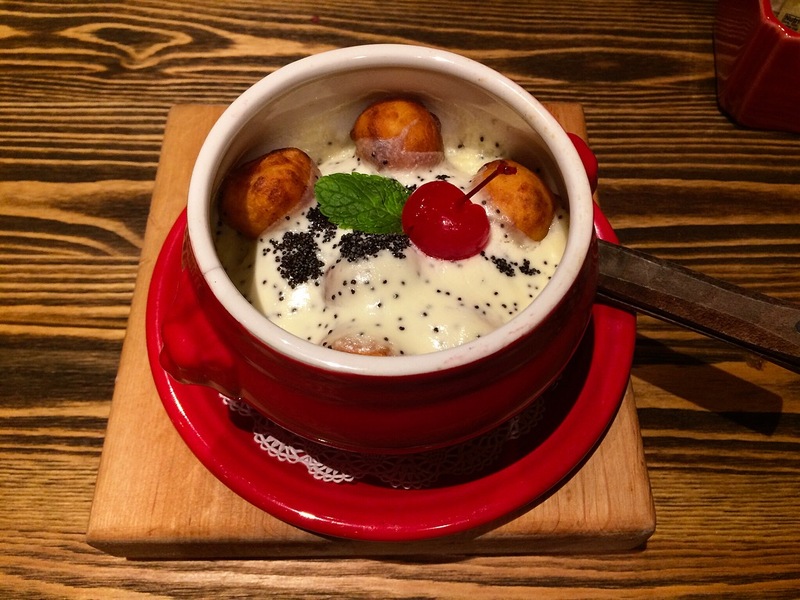 The most unusual dessert was warm Orshanskie (“сырники оршанские в чугунке”, literally Orsha cheese pancakes in a pot, Orsha being a city in Belarus), mini cheese balls with a few raisins added for good measure bathed in a sweet sour cream and poppy seed sauce. Surprisingly good! This is Anastasia. Proficient in many languages, she studied linguistics and considered becoming an interpreter before coming to the US. Helpful, attentive, charming, and always anticipating our needs, all of us fell in love with her as she answered our unending questions and pampered us as if we were royalty. She is an angel. The man who started it all. 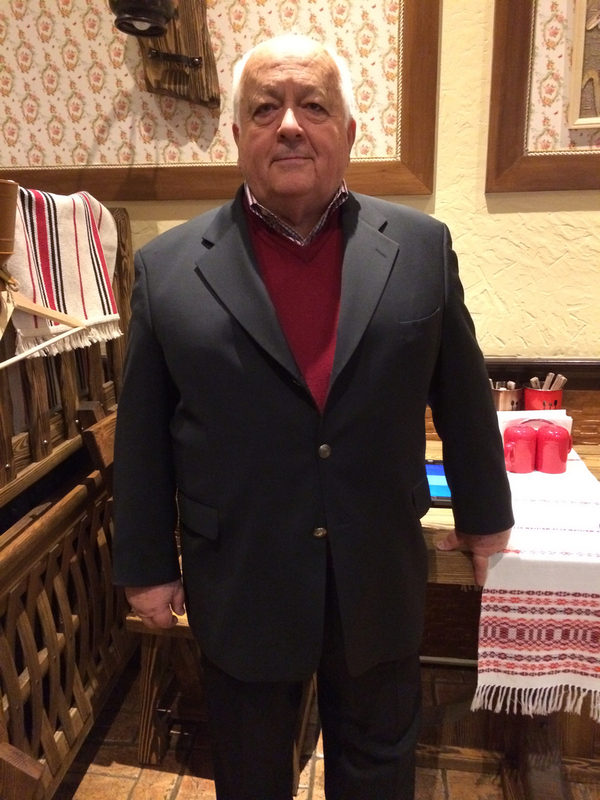 Marat Novikov, a restaurateur and businessman from Minsk, opened the original Belarussian Xata in Moscow in 2012. A warm and generous man, he operates his Brooklyn branch ably assisted by family members. His genuine hospitality and outstanding cuisine made for an unforgettable dining experience that we are all eager to revisit. Don’t lose any time in planning your visit to Belarussian Xata, 1655 Sheepshead Bay Road in Brooklyn. This entry was posted in Restaurant Reviews - Extended, Restaurants & Food Courts and tagged Belarusian, Belarussian by Rich. Bookmark the permalink. Stunning! You have to take me back for a 5th time!